Chess is a two-player strategy board game played on a chessboard, a checkered gameboard with 64 squares arranged in an 8×8 grid. The game is played by millions of people worldwide. Each player begins with 16 pieces: one king, one queen, two rooks, two knights, two bishops, and eight pawns. Each of the six piece types moves differently, with the most powerful being the queen and the least powerful the pawn. The objective is to checkmate the opponent's king by placing it under an inescapable threat of capture. To this end, a player's pieces are used to attack and capture the opponent's pieces, while supporting each other. In addition to checkmate, the game can be won by voluntary resignation of the opponent, which typically occurs when too much material is lost or checkmate appears unavoidable. There are also several ways a game can end in a draw. Chess is believed to have originated in India sometime before the 7th century. The game was derived from the Indian game chaturanga, which is also the likely ancestor of the Eastern strategy games xiangqi, janggi, and shogi. (A minority view holds that chess originated in China.) The pieces assumed their current powers in Spain in the late 15th century; the rules were finally standardized in the 19th century. The first generally recognized World Chess Champion, Wilhelm Steinitz, claimed his title in 1886. Since 1948, the World Championship has been regulated by FIDE, the game's international governing body. FIDE awards titles to skilled players, the highest of which is grandmaster. Many national chess organizations also have a title system; however, these are not recognized by FIDE. FIDE also organizes the Women's World Championship, the World Junior Championship, the World Senior Championship, the Blitz and Rapid World Championships, and the Chess Olympiad, a popular competition among international teams. There is also a Correspondence Chess World Championship and a World Computer Chess Championship. Online chess has opened amateur and professional competition to a wide and varied group of players. Until recently, the International Olympic Committee had recognized chess as a sport; some national sporting bodies such as the Spanish Consejo Superior de Deportes also recognize chess as a sport. Chess was included in the 2006 and 2010 Asian Games. Since the second half of the 20th century, computers have been programmed to play chess with increasing success, to the point where the strongest personal computers play at a higher level than the best human players. Since the 1990s, computer analysis has contributed significantly to chess theory, particularly in the endgame. The IBM computer Deep Blue was the first machine to overcome a reigning World Chess Champion in a match when it defeated Garry Kasparov in 1997. The rise of strong computer programs (called "engines") runnable on hand-held devices has led to increasing concerns about cheating during tournaments. There are many variants of chess that utilize different rules, pieces, or boards. One of these, Chess960 (originally "Fischerandom"), has gained widespread popularity as well as some FIDE recognition. Licensed under Creative Commons Attribution-Share Alike 3.0 (Alan Light). Casual games usually last 10 to 60 minutes; tournament games last anywhere from about ten minutes (fast chess) to six hours or more. Chess is a two-player strategy board game played on a chessboard, a checkered gameboard with 64 squares arranged in an 8×8 grid. The game is played by millions of people worldwide. Each player begins with 16 pieces: one king, one queen, two rooks, two knights, two bishops, and eight pawns. Each of the six piece types moves differently, with the most powerful being the queen and the least powerful the pawn. The objective is to checkmate[note 1] the opponent's king by placing it under an inescapable threat of capture. To this end, a player's pieces are used to attack and capture the opponent's pieces, while supporting each other. In addition to checkmate, the game can be won by voluntary resignation of the opponent, which typically occurs when too much material is lost or checkmate appears unavoidable. There are also several ways a game can end in a draw. Chess is believed to have originated in India sometime before the 7th century. The game was derived from the Indian game chaturanga, which is also the likely ancestor of the Eastern strategy games xiangqi, janggi, and shogi. (A minority view holds that chess originated in China.) The pieces assumed their current powers in Spain in the late 15th century; the rules were finally standardized in the 19th century. The first generally recognized World Chess Champion, Wilhelm Steinitz, claimed his title in 1886. Since 1948, the World Championship has been regulated by FIDE, the game's international governing body. FIDE awards titles to skilled players, the highest of which is grandmaster. Many national chess organizations also have a title system; however, these are not recognized by FIDE. FIDE also organizes the Women's World Championship, the World Junior Championship, the World Senior Championship, the Blitz and Rapid World Championships, and the Chess Olympiad, a popular competition among international teams. There is also a Correspondence Chess World Championship and a World Computer Chess Championship. Online chess has opened amateur and professional competition to a wide and varied group of players. Until recently, the International Olympic Committee had recognized chess as a sport; some national sporting bodies such as the Spanish Consejo Superior de Deportes also recognize chess as a sport. Chess was included in the 2006 and 2010 Asian Games. Since the second half of the 20th century, computers have been programmed to play chess with increasing success, to the point where the strongest personal computers play at a higher level than the best human players. Since the 1990s, computer analysis has contributed significantly to chess theory, particularly in the endgame. The IBM computer Deep Blue was the first machine to overcome a reigning World Chess Champion in a match when it defeated Garry Kasparov in 1997. The rise of strong computer programs (called "engines") runnable on hand-held devices has led to increasing concerns about cheating during tournaments. There are many variants of chess that utilize different rules, pieces, or boards. One of these, Chess960 (originally "Fischerandom"), has gained widespread popularity as well as some FIDE recognition. The rules of chess are published by FIDE (Fédération Internationale des Échecs), chess's international governing body, in its Handbook. Rules published by national governing bodies, or by unaffiliated chess organizations, commercial publishers, etc., may differ. FIDE's rules were most recently revised in 2017. Chess is played on a square board of eight rows (called ranks and denoted with numbers 1 to 8) and eight columns (called files and denoted with letters a to h). The colors of the 64 squares alternate and are referred to as light and dark squares. The chessboard is placed with a light square at the right-hand end of the rank nearest to each player. By convention, the game pieces are divided into white and black sets, and the players are referred to as White and Black respectively. Each player begins the game with 16 pieces of the specified color, which consist of one king, one queen, two rooks, two bishops, two knights, and eight pawns. The pieces are set out as shown in the diagram and photo, with each queen on a square of its own color, the white queen on a light square and the black queen on a dark. The player with the white pieces always moves first. After the first move, players alternately move one piece per turn (except for castling, when two pieces are moved). Pieces are moved to either an unoccupied square or one occupied by an opponent's piece, which is captured and removed from play. With the sole exception of en passant, all pieces capture by moving to the square that the opponent's piece occupies. A player may not make any move that would put or leave the player's own king under attack. A player cannot "pass"; at each turn one must make a legal move (this is the basis for the finesse called zugzwang). If the player to move has no legal move, the game is over; it is either a checkmate (a loss for the player with no legal moves) if the king is under attack, or a stalemate (a draw) if the king is not. Each chess piece has its own way of moving. In the diagrams, the dots mark the squares where the piece can move if there are no intervening piece(s) of either color. The king moves one square in any direction. The king also has a special move called castling that involves also moving a rook. The rook can move any number of squares along a rank or file, but cannot leap over other pieces. Along with the king, a rook is involved during the king's castling move. The bishop can move any number of squares diagonally, but cannot leap over other pieces. The queen combines the power of a rook and bishop and can move any number of squares along a rank, file, or diagonal, but cannot leap over other pieces. The pawn can move forward to the unoccupied square immediately in front of it on the same file, or on its first move it can advance two squares along the same file, provided both squares are unoccupied (black dots in the diagram); or the pawn can capture an opponent's piece on a square diagonally in front of it on an adjacent file, by moving to that square (black "x"s). A pawn has two special moves: the en passant capture and promotion. Neither the king nor the rook have previously moved during the game. There cannot be any pieces between the king and the rook. The king cannot be in check, nor can the king pass through squares that are under attack by enemy pieces, or move to a square where it would result in a check. Note that castling is permissible if the rook is attacked, or if the rook crosses a square that is attacked. When a pawn advances two squares from its starting position and there is an opponent's pawn on an adjacent file next to its destination square, then the opponent's pawn can capture it en passant (in passing), and move to the square the pawn passed over. This can only be done on the very next move, otherwise the right to do so is forfeit. For example, if the black pawn has just advanced two squares from g7 (initial starting position) to g5, then the white pawn on f5 may take it via en passant on g6 (but only on White's next move). When a king is under immediate attack by one or two of the opponent's pieces, it is said to be in check. A response to a check is a legal move if it results in a position where the king is no longer under direct attack (that is, not in check). This can involve capturing the checking piece; interposing a piece between the checking piece and the king (which is possible only if the attacking piece is a queen, rook, or bishop and there is a square between it and the king); or moving the king to a square where it is not under attack. Castling is not a permissible response to a check. The object of the game is to checkmate the opponent; this occurs when the opponent's king is in check, and there is no legal way to remove it from attack. It is illegal for a player to make a move that would put or leave the player's own king in check. In casual games it is common to announce "check" when putting the opponent's king in check, but this is not required by the rules of the game, and is not usually done in tournaments. Checkmate: The player whose turn it is to move is in check and has no legal move to escape check. Resignation: Either player may resign, conceding the game to the opponent. It is usually considered poor etiquette to play on in a truly hopeless position, and for this reason high-level games rarely end in checkmate. Win on time: In games with a time control, a player wins if the opponent runs out of time, even if the opponent has a much superior position, as long as the player still has a theoretical possibility to checkmate the opponent. Forfeit: A player who cheats, or violates the rules of the game, or violates the rules specified for the particular tournament can be forfeited. In high-level tournaments, players have been forfeited for such things as arriving late for the game (even by a matter of seconds), receiving a call or text on a cell phone, refusing to undergo a drug test, refusing to undergo a body search for electronic devices, and unsporting behavior (such as refusing to shake the opponent's hand). Draw by agreement: Draws are most commonly reached by mutual agreement between the players. The correct procedure is to verbally offer the draw, make a move, then start the opponent's clock. Traditionally, players have been allowed to agree to a draw at any point in the game, occasionally even without playing a move; in recent years efforts have been made to discourage short draws, for example by forbidding draw offers before move thirty. Stalemate: The player whose turn it is to move has no legal move and is not in check. Threefold repetition of position: This most commonly occurs when neither side is able to avoid repeating moves without incurring a disadvantage. In this situation, either player can claim a draw; this requires the players to keep a valid written record of the game so that the claim can be verified by the arbiter if challenged. The three occurrences of the position need not occur on consecutive moves for a claim to be valid. FIDE rules make no mention of perpetual check; this is merely a specific type of draw by threefold repetition. Fivefold repetition of position: Similar to the threefold-repetition rule, but in this case neither player needs to claim the draw; thus a tournament director can intervene and declare the game to be drawn. This is a relatively recent (2014) addition to the FIDE rules. Seventy-five-move rule: Similar to the fifty-move rule; however, if the final move in the sequence resulted in checkmate, this takes precedence. As with the fivefold-repetition rule, this applies independently of claims by the players, and allows a tournament director to intervene. This rule likewise is a recent addition to the FIDE rules. Insufficient material: If neither player has a theoretical possibility to checkmate the opponent; for example, if a player has only the king and a knight left, and the opponent has only the king left, checkmate is impossible and the game is drawn by this rule. On the other hand, if both players have a king and a knight left, there is a highly unlikely yet theoretical possibility of checkmate, so this rule does not apply. Draw on time: In games with a time control, the game is drawn if a player is out of time and the opponent has no theoretical possibility to checkmate the player. Chess games may also be played with a time control. If a player's time runs out before the game is completed, the game is automatically lost (provided the opponent has enough pieces left to deliver checkmate). The duration of a game ranges from long (or "classical") games which can take up to seven hours (even longer if adjournments are permitted) to bullet chess (under 3 minutes per player for the entire game). Intermediate between these are rapid chess games, lasting between 20 minutes and two hours per game, a popular time control in amateur weekend tournaments. Time is controlled using a chess clock that has two displays, one for each player's remaining time. Analog chess clocks have been largely replaced by digital clocks, which allow for time controls with increments. Chess games and positions are recorded using a system of notation, most commonly algebraic chess notation. Abbreviated (or short) algebraic notation generally records moves in the format "abbreviation of the piece moved – file where it moved – rank where it moved". The pieces are identified by their initials. In English, these are K (King), Q (Queen), R (Rook), B (Bishop), and N (Knight; N is used to avoid confusion with King). For example, Qg5 means "queen moves to the g-file and the 5th rank" (that is, to the square g5). Chess literature published in other languages may use different initials to indicate the pieces, or Figurine Algebraic Notation may be used to avoid language difficulties. To resolve ambiguities, one more letter or number is added to indicate the file or rank from which the piece moved, e.g. Ngf3 means "knight from the g-file moves to the square f3", and R1e2 means "rook on the first rank moves to e2". The letter P for a pawn is not used, so that e4 means "pawn moves to the square e4". If the piece makes a capture, "x" is inserted before the destination square. Thus Bxf3 means "bishop captures on f3". When a pawn makes a capture, the file from which the pawn departed is used in place of a piece initial, and ranks may be omitted if unambiguous. For example, exd5 (pawn on the e-file captures the piece on d5) or exd (pawn on the e-file captures a piece somewhere on the d-file). Particularly in Germany, some publications have used ":" rather than "x" to indicate a capture, but this is now rare. Some publications omit the capture symbol altogether, so that exd5 would be rendered simply as "ed". If a pawn moves to its last rank, achieving promotion, the piece chosen is indicated after the move, for example e1Q or e1=Q. Castling is indicated by the special notations 0-0 for kingside castling and 0-0-0 for queenside castling. An en passant capture is sometimes marked with the notation "e.p." A move that places the opponent's king in check usually has the notation "+" added. (The notation "++" for a double check is considered obsolete.) Checkmate can be indicated by "#". At the end of the game, "1–0" means "White won", "0–1" means "Black won", and "½–½" indicates a draw. Chess moves can be annotated with punctuation marks and other symbols. For example, "!" indicates a good move, "!!" an excellent move, "?" a mistake, "??" a blunder, "!?" an interesting move that may not be best, or "?!" a dubious move not easily refuted. The text-based Portable Game Notation (PGN), which is understood by chess software, is based on short form English language algebraic notation. A few players still prefer descriptive notation, but it is no longer recognized by FIDE. Another system is ICCF numeric notation, recognized by the International Correspondence Chess Federation though its use is in decline. Squares are identified by numeric coordinates, for example a1 is "11" and h8 is "88". Moves are described by the "from" and "to" squares, and captures are not indicated. For example, the opening move 1.e4 is rendered as 1.5254. Castling is described by the king's move only, for example 5171 for White castling kingside, 5838 for Black castling queenside. In chess, tactics in general concentrate on short-term actions – so short-term that they can be calculated in advance by a human player or by a computer. The possible depth of calculation depends on the player's ability. In quiet positions with many possibilities on both sides, a deep calculation is more difficult and may not be practical, while in "tactical" positions with a limited number of forced variations, strong players can calculate long sequences of moves. Simple one-move or two-move tactical actions – threats, exchanges of material, and double attacks – can be combined into more complicated combinations, sequences of tactical maneuvers that are often forced from the point of view of one or both players. Theoreticians describe many elementary tactical methods and typical maneuvers; for example, pins, forks, skewers, batteries, discovered attacks (especially discovered checks), zwischenzugs, deflections, decoys, sacrifices, underminings, overloadings, and interferences. The most basic step in evaluating a position is to count the total value of pieces of both sides. The point values used for this purpose are based on experience; usually pawns are considered worth one point, knights and bishops about three points each, rooks about five points (the value difference between a rook and a bishop or knight being known as the exchange), and queens about nine points. The king is more valuable than all of the other pieces combined, since its checkmate loses the game. But in practical terms, in the endgame the king as a fighting piece is generally more powerful than a bishop or knight but less powerful than a rook. These basic values are then modified by other factors like position of the piece (e.g. advanced pawns are usually more valuable than those on their initial squares), coordination between pieces (e.g. a pair of bishops usually coordinate better than a bishop and a knight), or the type of position (e.g. knights are generally better in closed positions with many pawns while bishops are more powerful in open positions). A chess opening is the group of initial moves of a game (the "opening moves"). Recognized sequences of opening moves are referred to as openings and have been given names such as the Ruy Lopez or Sicilian Defense. They are catalogued in reference works such as the Encyclopaedia of Chess Openings. There are dozens of different openings, varying widely in character from quiet positional play (for example, the Réti Opening) to very aggressive (the Latvian Gambit). In some opening lines, the exact sequence considered best for both sides has been worked out to more than 30 moves. Professional players spend years studying openings and continue doing so throughout their careers, as opening theory continues to evolve. The middlegame is the part of the game which starts after the opening. There is no clear line between the opening and the middlegame, but typically the middlegame will start when most pieces have been developed. (Similarly, there is no clear transition from the middlegame to the endgame; see start of the endgame.) Because the opening theory has ended, players have to form plans based on the features of the position, and at the same time take into account the tactical possibilities of the position. The middlegame is the phase in which most combinations occur. Combinations are a series of tactical moves executed to achieve some gain. Middlegame combinations are often connected with an attack against the opponent's king. Some typical patterns have their own names; for example, the Boden's Mate or the Lasker–Bauer combination. Pawns become more important. Endgames often revolve around endeavors to promote a pawn by advancing it to the furthest rank. The king, which required safeguarding from checkmate in the middlegame, emerges as a strong piece in the endgame. It is often brought to the center of the board where it can protect its own pawns, attack enemy pawns, and hinder moves of the opponent's king. Zugzwang, disadvantageous since it forces a player to move, is often a factor in endgames but rarely in other stages of the game. In the example diagram, either side having the move is in zugzwang: Black to move must play 1...Kb7 allowing White to promote the pawn after 2.Kd7; White to move must permit a draw, either by 1.Kc6 stalemate or by losing the pawn after any other legal move. Endgames can be classified according to the type of pieces remaining on the board. Basic checkmates are positions in which one side has only a king and the other side has one or two pieces and can checkmate the opposing king, with the pieces working together with their king. For example, king and pawn endgames involve only kings and pawns on one or both sides, and the task of the stronger side is to promote one of the pawns. Other more complicated endings are classified according to pieces on the board other than kings, such as "rook and pawn versus rook" endgames. The oldest archaeological artifacts, ivory chess pieces, were excavated in ancient Afrasiab, today's Samarkand, in Uzbekistan, central Asia, and date to about 760, with some of them possibly older. The oldest known chess manual was in Arabic and dates to 840–850, written by al-Adli ar-Rumi (800–870), a renowned Arab chess player, titled Kitab ash-shatranj (Book of the chess). This is a lost manuscript, but referenced in later works. The eastern migration of chess, into China and Southeast Asia, has even less documentation than its migration west. The first reference to chess, called Xiang Qi, in China comes in the xuán guaì lù (玄怪录, record of the mysterious and strange) dating to about 800. Alternatively, some contend that chess arose from Chinese chess or one of its predecessors, although this has been contested. The game reached Western Europe and Russia by at least three routes, the earliest being in the 9th century. By the year 1000, it had spread throughout Europe. Introduced into the Iberian Peninsula by the Moors in the 10th century, it was described in a famous 13th-century manuscript covering shatranj, backgammon, and dice named the Libro de los juegos. Around 1200, the rules of shatranj started to be modified in southern Europe, and around 1475, several major changes made the game essentially as it is known today. These modern rules for the basic moves had been adopted in Italy and Spain. Pawns gained the option of advancing two squares on their first move, while bishops and queens acquired their modern abilities. The queen replaced the earlier vizier chess piece towards the end of the 10th century and by the 15th century had become the most powerful piece; consequently modern chess was referred to as "Queen's Chess" or "Mad Queen Chess". Castling, derived from the "kings leap" usually in combination with a pawn or rook move to bring the king to safety, was introduced. These new rules quickly spread throughout western Europe. The rules concerning stalemate were finalized in the early 19th century. Also in the 19th century, the convention that White moves first was established (formerly either White or Black could move first). Finally the rules around castling were standardized – variations in the castling rules had persisted in Italy until the late 19th century. The resulting standard game is sometimes referred to as Western chess or international chess, particularly in Asia where other games of the chess family such as xiangqi are prevalent. Since the 19th century, the only rule changes have been technical in nature, for example establishing the correct procedure for claiming a draw by repetition. The romantic era was characterized by opening gambits (sacrificing pawns or even pieces), daring attacks, and brazen sacrifices. Many elaborate and beautiful but unsound move sequences called "combinations" were played by the masters of the time. The game was played more for art than theory. A profound belief that chess merit resided in the players' genius rather than inherent in the position on the board pervaded chess practice. Chess was occasionally criticised in the 19th century as a waste of time. The first modern chess tournament was organized by Howard Staunton, a leading English chess player, and was held in London in 1851. It was won by the German Adolf Anderssen, who was hailed as the leading chess master. His brilliant, energetic attacking style was typical for the time. Sparkling games like Anderssen's Immortal game and Evergreen game or Morphy's Opera game were regarded as the highest possible summit of the chess art. Deeper insight into the nature of chess came with two younger players. American Paul Morphy, an extraordinary chess prodigy, won against all important competitors (except Howard Staunton, who refused to play), including Anderssen, during his short chess career between 1857 and 1863. Morphy's success stemmed from a combination of brilliant attacks and sound strategy; he intuitively knew how to prepare attacks. Prague-born Wilhelm Steinitz beginning in 1873 described how to avoid weaknesses in one's own position and how to create and exploit such weaknesses in the opponent's position. The scientific approach and positional understanding of Steinitz revolutionized the game. Steinitz was the first to break a position down into its components. Before Steinitz, players brought their queen out early, did not completely develop their other pieces, and mounted a quick attack on the opposing king, which either succeeded or failed. The level of defense was poor and players did not form any deep plan. In addition to his theoretical achievements, Steinitz founded an important tradition: his triumph over the leading German master Johannes Zukertort in 1886 is regarded as the first official World Chess Championship. Steinitz lost his crown in 1894 to a much younger player, the German mathematician Emanuel Lasker, who maintained this title for 27 years, the longest tenure of all World Champions. After the end of the 19th century, the number of master tournaments and matches held annually quickly grew. Some sources state that in 1914 the title of chess Grandmaster was first formally conferred by Tsar Nicholas II of Russia to Lasker, Capablanca, Alekhine, Tarrasch, and Marshall, but this is a disputed claim. [note 5] The tradition of awarding such titles was continued by the World Chess Federation (FIDE), founded in 1924 in Paris. In 1927, the Women's World Chess Championship was established; the first to hold the title was Czech-English master Vera Menchik. It took a prodigy from Cuba, José Raúl Capablanca (World Champion 1921–1927), who loved simple positions and endgames, to end the German-speaking dominance in chess; he was undefeated in tournament play for eight years, until 1924. His successor was Russian-French Alexander Alekhine, a strong attacking player who died as the World champion in 1946. He briefly lost the title to Dutch player Max Euwe in 1935 and regained it two years later. After the death of Alekhine, a new World Champion was sought. FIDE, which has controlled the title since then (except for one interruption), ran a tournament of elite players. The winner of the 1948 tournament, Russian Mikhail Botvinnik, started an era of Soviet dominance in the chess world. Until the end of the Soviet Union, there was only one non-Soviet champion, American Bobby Fischer (champion 1972–1975). Botvinnik revolutionized opening theory. Previously Black strove for equality, to neutralize White's first-move advantage. As Black, Botvinnik strove for the initiative from the beginning. In the previous informal system of World Championships, the current champion decided which challenger he would play for the title and the challenger was forced to seek sponsors for the match. FIDE set up a new system of qualifying tournaments and matches. The world's strongest players were seeded into Interzonal tournaments, where they were joined by players who had qualified from Zonal tournaments. The leading finishers in these Interzonals would go on the "Candidates" stage, which was initially a tournament, and later a series of knockout matches. The winner of the Candidates would then play the reigning champion for the title. A champion defeated in a match had a right to play a rematch a year later. This system operated on a three-year cycle. Botvinnik participated in championship matches over a period of fifteen years. He won the world championship tournament in 1948 and retained the title in tied matches in 1951 and 1954. In 1957, he lost to Vasily Smyslov, but regained the title in a rematch in 1958. In 1960, he lost the title to the 23-year-old Latvian prodigy Mikhail Tal, an accomplished tactician and attacking player. Botvinnik again regained the title in a rematch in 1961. Following the 1961 event, FIDE abolished the automatic right of a deposed champion to a rematch, and the next champion, Armenian Tigran Petrosian, a player renowned for his defensive and positional skills, held the title for two cycles, 1963–1969. His successor, Boris Spassky from Russia (champion 1969–1972), won games in both positional and sharp tactical style. The next championship, the so-called Match of the Century, saw the first non-Soviet challenger since World War II, American Bobby Fischer, who defeated his Candidates opponents by unheard-of margins and clearly won the world championship match. In 1975, however, Fischer refused to defend his title against Soviet Anatoly Karpov when FIDE did not meet his demands, and Karpov obtained the title by default. Fischer modernized many aspects of chess, especially by extensively preparing openings. Karpov defended his title twice against Viktor Korchnoi and dominated the 1970s and early 1980s with a string of tournament successes. Karpov's reign finally ended in 1985 at the hands of Garry Kasparov, another Soviet player from Baku, Azerbaijan. Kasparov and Karpov contested five world title matches between 1984 and 1990; Karpov never won his title back. In 1993, Garry Kasparov and Nigel Short broke with FIDE to organize their own match for the title and formed a competing Professional Chess Association (PCA). From then until 2006, there were two simultaneous World Champions and World Championships: the PCA or Classical champion extending the Steinitzian tradition in which the current champion plays a challenger in a series of many games, and the other following FIDE's new format of many players competing in a tournament to determine the champion. Kasparov lost his Classical title in 2000 to Vladimir Kramnik of Russia. The World Chess Championship 2006, in which Kramnik beat the FIDE World Champion Veselin Topalov, reunified the titles and made Kramnik the undisputed World Chess Champion. In September 2007, he lost the title to Viswanathan Anand of India, who won the championship tournament in Mexico City. Anand defended his title in the revenge match of 2008, 2010 and 2012. In 2013, Magnus Carlsen beat Anand in the 2013 World Chess Championship. He defended his title the following year, again against Anand, and is the reigning world champion. Chess remains a highly popular pastime among the general populace. A 2012 survey found that "chess players now make up one of the largest communities in the world: 605 million adults play chess regularly". Chess is played at least once a year by 12% of British people, 15% of Americans, 23% of Germans, 43% of Russians, and 70% of Indian people. With these or similar views, chess is taught to children in schools around the world today. Many schools host chess clubs, and there are many scholastic tournaments specifically for children. Tournaments are held regularly in many countries, hosted by organizations such as the United States Chess Federation and the National Scholastic Chess Foundation. Chess is often depicted in the arts; significant works where chess plays a key role range from Thomas Middleton's A Game at Chess to Through the Looking-Glass by Lewis Carroll, to Vladimir Nabokov's The Defense, to The Royal Game by Stefan Zweig. Chess is featured in films like Ingmar Bergman's The Seventh Seal and Satyajit Ray's The Chess Players. Chess is also present in contemporary popular culture. For example, the characters in Star Trek play a futuristic version of the game called "Tri-Dimensional Chess". "Wizard's Chess" is featured in J.K. Rowling's Harry Potter plays. The hero of Searching for Bobby Fischer struggles against adopting the aggressive and misanthropic views of a world chess champion. Chess is used as the core theme in the musical Chess by Tim Rice, Björn Ulvaeus, and Benny Andersson. The thriller film Knight Moves is about a chess grandmaster who is accused of being a serial killer. Pawn Sacrifice, starring Tobey Maguire as Bobby Fischer and Liev Schreiber as Boris Spassky, depicts the drama surrounding the 1972 World Chess Championship in Iceland during the Cold War. Directmates: White to move first and checkmate Black within a specified number of moves, against any defense. These are often referred to as "mate in n" – for example "mate in three" (a three-mover); two- and three-move problems are the most common. These usually involve positions that would be highly unlikely to occur in an actual game, and are intended to illustrate a particular theme, usually requiring a surprising or counter-intuitive key move. Studies: orthodox problems where the stipulation is that White to play must win or draw. Almost all studies are endgame positions. Chess composition is a distinct branch of chess sport, and tournaments exist for both the composition and solving of chess problems. The current World Chess Champion is Magnus Carlsen of Norway. The reigning Women's World Champion is Hou Yifan from China. The world's highest rated female player, Judit Polgár, has never participated in the Women's World Chess Championship, instead preferring to compete with the leading men and maintaining a ranking among the top male players. Regular team chess events include the Chess Olympiad and the European Team Chess Championship. The World Chess Solving Championship and World Correspondence Chess Championships include both team and individual events. In order to rank players, FIDE, ICCF, and national chess organizations use the Elo rating system developed by Arpad Elo. Elo is a statistical system based on the assumption that the chess performance of each player in his or her games is a random variable. Arpad Elo thought of a player's true skill as the average of that player's performance random variable, and showed how to estimate the average from results of player's games. The US Chess Federation implemented Elo's suggestions in 1960, and the system quickly gained recognition as being both fairer and more accurate than older systems; it was adopted by FIDE in 1970. [note 7] The highest FIDE rating of all time, 2881, was achieved by Magnus Carlsen on the March 2014 FIDE rating list. Chess has a very extensive literature. In 1913, the chess historian H.J.R. Murray estimated the total number of books, magazines, and chess columns in newspapers to be about 5,000. B.H. Wood estimated the number, as of 1949, to be about 20,000. David Hooper and Kenneth Whyld write that, "Since then there has been a steady increase year by year of the number of new chess publications. No one knows how many have been printed." There are two significant public chess libraries: the John G. White Chess and Checkers Collection at Cleveland Public Library, with over 32,000 chess books and over 6,000 bound volumes of chess periodicals; and the Chess & Draughts collection at the National Library of the Netherlands, with about 30,000 books. Grandmaster Lothar Schmid owned the world's largest private collection of chess books and memorabilia. David DeLucia's chess library contains 7,000 to 8,000 chess books, a similar number of autographs (letters, score sheets, manuscripts), and about 1,000 items of "ephemera". Dirk Jan ten Geuzendam opines that DeLucia's collection "is arguably the finest chess collection in the world". The number of legal positions in chess is estimated to be about 1043, and is provably less than 1047, with a game-tree complexity of approximately 10123. The game-tree complexity of chess was first calculated by Claude Shannon as 10120, a number known as the Shannon number. Typically an average position has thirty to forty possible moves, but there may be as few as zero (in the case of checkmate or stalemate) or as many as 218. Chess has inspired many combinatorial puzzles, such as the knight's tour and the eight queens puzzle. One of the most important mathematical challenges of chess is the development of algorithms that can play chess. The idea of creating a chess-playing machine dates to the 18th century; around 1769, the chess-playing automaton called The Turk became famous before being exposed as a hoax. Serious trials based on automata, such as El Ajedrecista, were too complex and limited to be useful. The Association for Computing Machinery (ACM) held the first major chess tournament for computers, the North American Computer Chess Championship, in September 1970. CHESS 3.0, a chess program from Northwestern University, won the championship. Nowadays, chess programs compete in the World Computer Chess Championship, held annually since 1974. At first considered only a curiosity, the best chess playing programs have become extremely strong. In 1997, a computer won a chess match using classical time controls against a reigning World Champion for the first time: IBM's Deep Blue beat Garry Kasparov 3½–2½ (it scored two wins, one loss, and three draws). In 2009, a mobile phone won a category 6 tournament with a performance rating 2898: chess engine Hiarcs 13 running on the mobile phone HTC Touch HD won the Copa Mercosur tournament with nine wins and one draw. The best chess programs are now able to consistently beat the strongest human players, to the extent that human-computer matches no longer attract interest from chess players or media. In 1913, Ernst Zermelo used chess as a basis for his theory of game strategies, which is considered as one of the predecessors of game theory. Zermelo's theorem states that it is possible to solve chess, i.e. to determine with certainty the outcome of a perfectly played game (either white can force a win, or black can force a win, or both sides can force at least a draw). However, according to Claude Shannon, there are 1043 legal positions in chess, so it will take an impossibly long time to compute a perfect strategy with any feasible technology. The 11-category, game theoretical taxonomy of chess includes: two player, no-chance, combinatorial, Markov state (present state is all a player needs to move; although past state led up to that point, knowledge of the sequence of past moves is not required to make the next move, except to take into account of en passant and castling, which do depend on the past moves), zero sum, symmetric, perfect information, non-cooperative, discrete, extensive form (tree decisions, not payoff matrices), sequential. Generalized chess (played on n × n board, without the fifty-move rule) is EXPTIME-complete. Some applications of combinatorial game theory to chess endgames were found by Elkies (1996). There is an extensive scientific literature on chess psychology. [note 9][note 10] Alfred Binet and others showed that knowledge and verbal, rather than visuospatial, ability lies at the core of expertise. In his doctoral thesis, Adriaan de Groot showed that chess masters can rapidly perceive the key features of a position. According to de Groot, this perception, made possible by years of practice and study, is more important than the sheer ability to anticipate moves. De Groot showed that chess masters can memorize positions shown for a few seconds almost perfectly. The ability to memorize does not alone account for chess-playing skill, since masters and novices, when faced with random arrangements of chess pieces, had equivalent recall (about half a dozen positions in each case). Rather, it is the ability to recognize patterns, which are then memorized, which distinguished the skilled players from the novices. When the positions of the pieces were taken from an actual game, the masters had almost total positional recall. 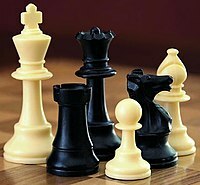 More recent research has focused on chess as mental training; the respective roles of knowledge and look-ahead search; brain imaging studies of chess masters and novices; blindfold chess; the role of personality and intelligence in chess skill; gender differences; and computational models of chess expertise. The role of practice and talent in the development of chess and other domains of expertise has led to a lot of research recently. Ericsson and colleagues have argued that deliberate practice is sufficient for reaching high levels of expertise in chess. Recent research indicates that factors other than practice are also important. For example, Fernand Gobet and colleagues have shown that stronger players started playing chess at a young age and that experts born in the Northern Hemisphere are more likely to have been born in late winter and early spring. Compared to general population, chess players are more likely to be non-right-handed, though they found no correlation between handedness and skill. Although the link between performance in chess and general intelligence is often assumed, researchers have largely failed to confirm its existence. For example, a 2006 study found no differences in fluid intelligence, as measured by Raven's Progressive Matrices, between strong adult chess players and regular people. There is some evidence towards a correlation between performance in chess and intelligence among beginning players. However, performance in chess also relies substantially on one's experience playing the game, and the role of experience may overwhelm the role of intelligence. Chess experts are estimated to have in excess of 10,000 and possibly as many as 300,000 position patterns stored in their memory; long training is necessary to acquire that amount of data. A 2007 study of young chess players in the United Kingdom found that strong players tended to have above-average IQ scores, but, within that group, the correlation between chess skill and IQ was moderately negative, meaning that smarter children tended to achieve a lower level of chess skill. This result was explained by a negative correlation between intelligence and practice in the elite subsample, and by practice having a higher influence on chess skill. Direct predecessors of chess such as chaturanga and shatranj. Traditional national or regional games that share common ancestors with Western chess such as xiangqi, shogi, janggi, makruk, and sittuyin. Infinite chess, which has drawn the attention of mathematicians. In the context of chess variants, regular (i.e. FIDE) chess is sometimes referred to as Western chess, international chess, orthodox chess, and orthochess. In 2016 in Saudi Arabia, Grand Mufti Abdul-Aziz ibn Abdullah Al ash-Sheikh issued a religious fatwa declaring that chess is banned for Muslims. He stated that "chess is a waste of time and an opportunity to squander money. It causes enmity and hatred between people". However, this fatwa is not legally binding and chess remains a popular game in Muslim countries.